Use Language for Writing to lead your students towards independence as writers. 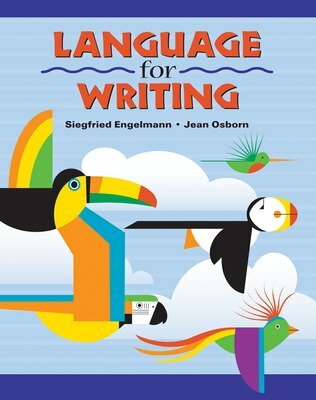 This revision and expansion of Distar Language III teaches not only writing skills, but also the vocabulary, sentence, and organizational skills that underpin good writing. Ongoing exercises support the development of specific writing skills by showing students how to write narratives, use specific words, make precise comparisons, summarize and retell, and proofread for punctuation, grammar, and usage. Language for Writing is a comprehensive writing program for students who need a highly structured approach if they are to learn to write well. The program teaches the conventions students need to write clearly; the vocabulary needed to describe actions, events, and objects; and the sentence structures required to put ideas into writing. To achieve these goals, Language for Writing provides carefully structured instruction in the use of language, both written and spoken. Helps students learn to use grammar and punctuation to make their writing clear. Daily lessons show students how to organize and develop what they want to say and guide them in the process in getting it down on paper. Students become comfortable with writing, build confidence, and acquire concepts and skills that enable them to express themselves clearly and discuss written language. Explicit, straight-forward lesson plans make it easy to teach important language and writing concepts. Small steps and appropriate scaffolding help students become comfortable with the demands of writing. Carefully sequenced lessons allow students to move seamlessly from activity to activity and develop all aspects of better writing. Program assessments occur every 10 lessons, giving you information about students’ mastery of content and assistance in helping those who need extra practice.